This couple from Russian has a very special pet. Unlike every other family who prefers getting a cat or a dog, the Panteleenko family from Moscow just got themselves a bear. They adopted him when he was a three months old cub, found in the forest by hunters, he lost he mother and he would have never made it all alone in the woods. Svetlana and Yuriy decided to give the little bear home. They have been growing him ever since, and despite of the judgments, they claim his bear Stepan is a gentle soul – he is playful, and not aggressive at all. They sit at the table together, and even watch TV settling themselves nicely on the couch. As a member of the family Stepan has his place at the table too. They feed him with a spoon with fish, canned sweet milk, porridge, and… cake! 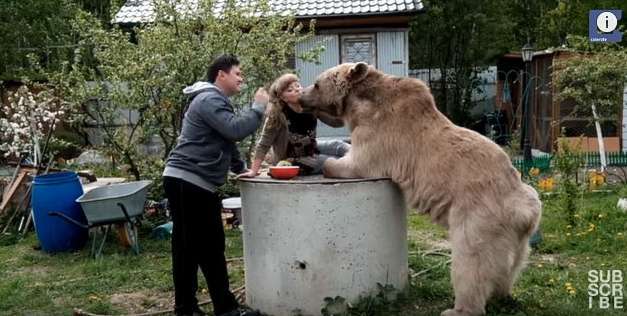 The bear is huge and obviously very strong, but Yuriy is sure he would never attack them, because they give them food and this way gain his trust. 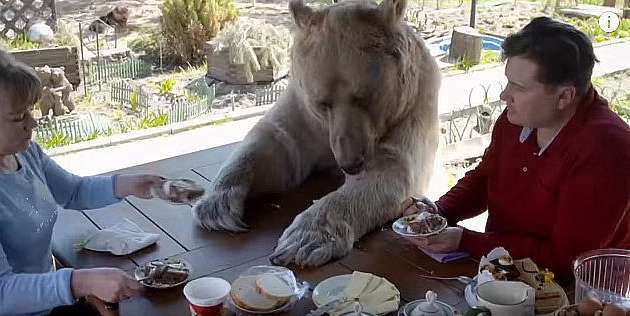 As we see, the bear Stepan has a good life being well fed, and receiving good care from his humans. The Panteleenkos seem to enjoy their pet bear, treating him like the child in the family.